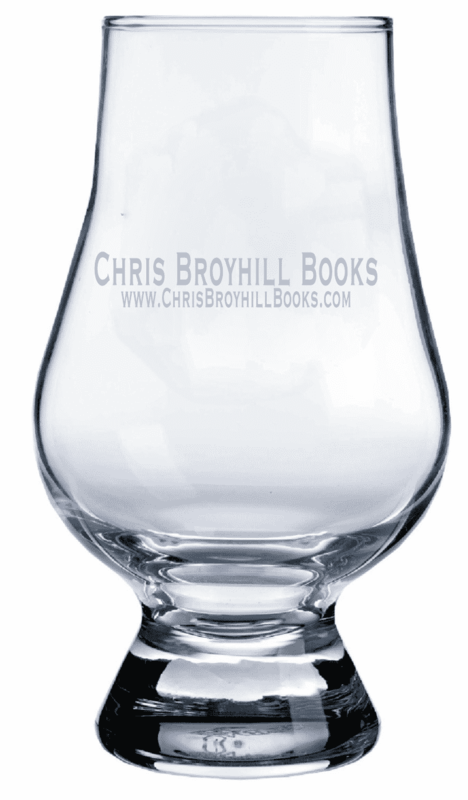 Colin Pearce and his author, Chris Broyhill, have something in common, their drink of choice is a fine Single Malt Scotch Whisky and when they choose their favorite drink they prefer to drink it in the Glencairn Style Glass. The Glencairn style is named after its developer Glencairn Crystal Ltd, Scotland who created the glass specifically for drinking whisky. The Glencairn is the first style to be endorsed by the Scotch Whisky Association and has received the Queens Awared for Innovation. This style whisky glass is in use by every whisky distillery in Scotland and Ireland. This style of glass is said to focus the whisky aromas and is therefore preferred by connoisseurs who consider the aroma especially important to the experience of a whisky. This limited edition glass comes deep etched with the Chris Broyhill Books brand and will surely become a collector’s piece. The minimum order is two pieces. Save on shipping by ordering up to 4 glasses for the same shipping cost as two pieces.